I don’t know whether I should thank Napoleon Grills or condemn them. My wife is fond of their Rogue Gas Grill and decided to learn the art of BBQ. Now every once a while she pushes me away to make a meal she likes. Less BBQ time for me… But more BBQ over all. So I decided to support her interest. After all the BBQ scene could use some female input. With the cloud cookie pizza she brings a first idea of what you can expect every once a while in the future. Disclosure: "This post features a sponsered test BBQ by Napoleon grills and affiliate links. All opionions shared are my own." The lady I’m talking about is the love of my life. 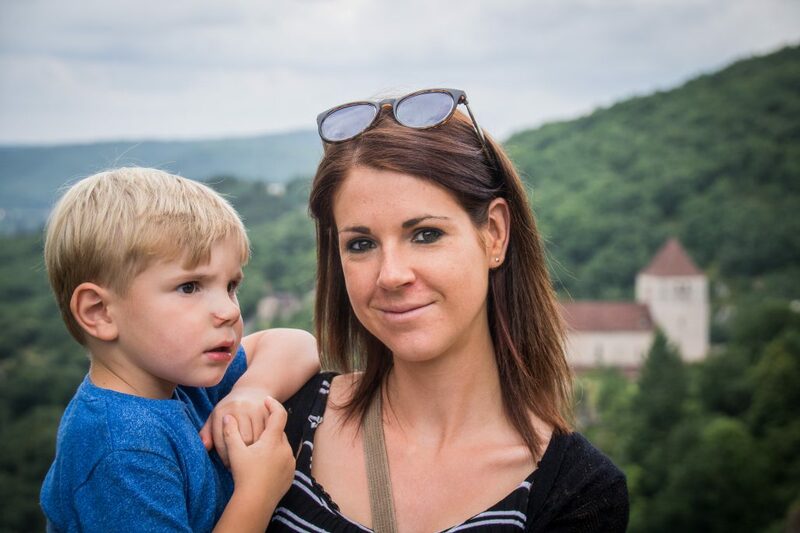 Sounds melow but it’s just the truth… However Annelien supports my passion for BBQ and blogging, we share a totally different style of cooking. As a sportive trendy lady she likes to make fast, light and healthy meals often packed with proteins. However I believe slow cooking brings more taste, she can bring a delicious meal in no time. She even convinced me a meal shouldn’t always contain meat to be delicious. I often forget I’m not eating my favorite piece of food. This lead me to adapt my cooking style every once a while. But I notice she’s becoming a fan of traditional BBQ too. Actually she’s mostly asking me to make another batch of pulled pork before I can think of it. I guess it’s just finding each other in the middle. As for BBQ it took her a while to get some interest in the cooking method. But the more I make the more she starts to ask how it works. However the threshold of lighting a fire made her hesitant so far. Until I got the Napoleon Rogue (available at amazon)for a couple of months. She probably was more excited than I was getting this test product and started cooking on it immediately. It’s awesome coming home after work and see a nice piece of grilled chicken in my plate. So we decided to team up and make a post together every once a while. So here’s the plan. Every first friday of the month we will try to bring a “lady @ the BBQ” recipe. I give her the freedom to make whatever she wants on the BBQ and meanwhile I’ll share her some tricks and tips on how to handle some different types of BBQ. I take some pictures and write down the post. So you can expect a lot more healthy (often vegetarian) food in the future along with some tips and tricks. The cloud cookie pizza is just a start. I guess it can only benefit the range of inspiration brought to you. And for those worried by the words healthy and/or vegetarian: “don’t be afraid”! Taste goes above health for her too! So here we are for the first recipe in the line. The cloud cookie pizza. A perfect example on how my lady cooks. Simple, light, healthy and fast as hell. I had a hard time trying to keep up with her for taking pictures. 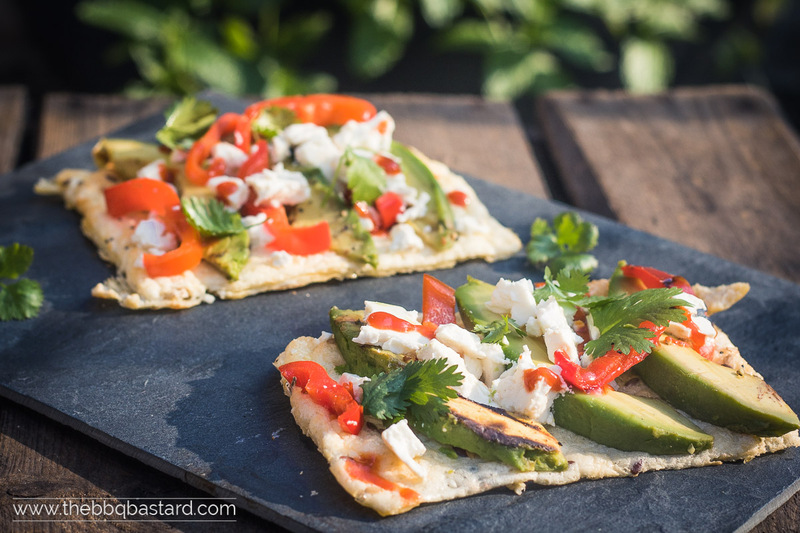 This cloud cookie pizza is a fitness proof meal. The pizza crust is replaced by cloud cookies. I had never heard of them but they taste delicious. She got the inspiration from the dutch blog “Mind your Feed“. And yes I’m often afraid when she comes up with those ideas too… But in the meantime I learned it mostly turns out good. So I rest my case. Cloud cookies are easy to make. You can do it by just mixing some beated egg whites with egg yolks, cottage cheese, baking powder and herbs. When you have made yourself a cloud cookie dough you can bake them in a cast iron plate on high heat until they are slightly browned. We found out flipping them improves the taste even more. As for the toppings you can go your own way. 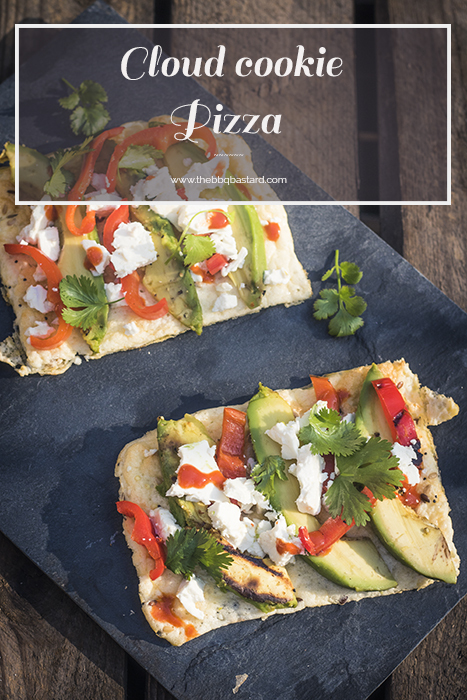 The lady makes them with grilled bell pepper, avocado and sriracha and tops them with feta cheese and cilantro. A delicious refreshing combination packed full of flavor. For this recipe she did a combination of direct grilling on a cast iron grid and cooking the cloud cookies on a cast iron plate. Let’s start with grilling the vegetables. She used the left and right burner on high heat to sear the vegetables. By grilling the vegetables on cast iron you get some nice grill marks and a delicious sweet tasting bell pepper and avocado in no time. Meanwhile she preheats the cast iron plate on the middle burner at medium heat. Using a preheated cast iron plate divides the heat equally so you have a nice brown cloud cookie pizza crust. To bake the cookies on the plate you need a dome temperature of 180°C/350°F. To obtain this temperature you lower the middle burner to the minimum and drop the outer burners to about medium heat. Bake the cookies for about 10 minutes on each side and top them with your favorite ingredients. So here we are at the first recipe of “the lady @ the BBQ”. We would like to hear your opinion! Are you open for some healthy BBQ inspiration or do you prefer the traditional BBQ? Who are your favorite BBQ ladies? Would your wife use the BBQ for cooking? Or are you just getting into it like mine? You should really try it! It’s a fun cooking method. If you stumble on the technical part just shoot your questions. I believe women can bring some inspiration to all of us and can handle a grill too! Just take a look at Hey, grill hey who proves there’s no need for the BBQ scene to be a men restricted passion. Tell us all about your experience on Facebook. We like to get inspired too! Find more vegetarian friendly meals over here. 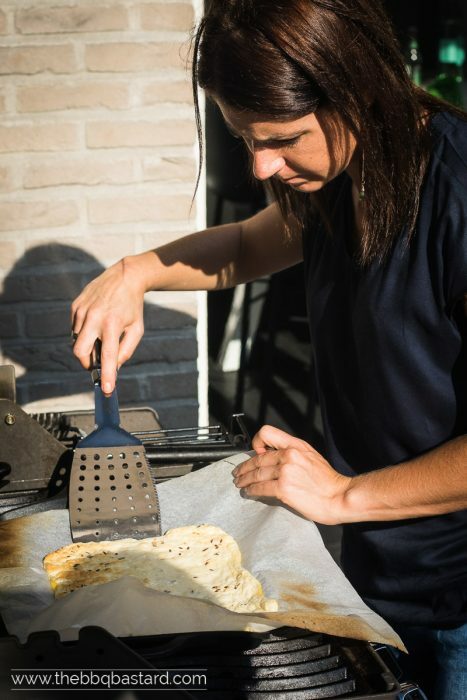 The first recipe in a brand new serie of posts: "The lady @ the grill" bringing some healthy food for people who love to sport and fitness. Often Vegetarian but most of all delicious. The cloud cookie pizza is a light yet delicious version of the classic pizza packed with proteins. Prepare your BBQ for cooking on direct heat on a high fire (read the post for instructions when cooking on a gas grill like the Napoleon Rogue). Use the outer burners for grilling the avocado and bell pepper until they have some nice grill marks. Meanwhile fire up the middle burner and preheat the cast iron plate at medium heat. Once the vegetables have some nice grill marks, remove them from fire, lower the heat to a dome temperature of 180°C/350°F. Meanwhile prepare the cloud cookie pizza dough. 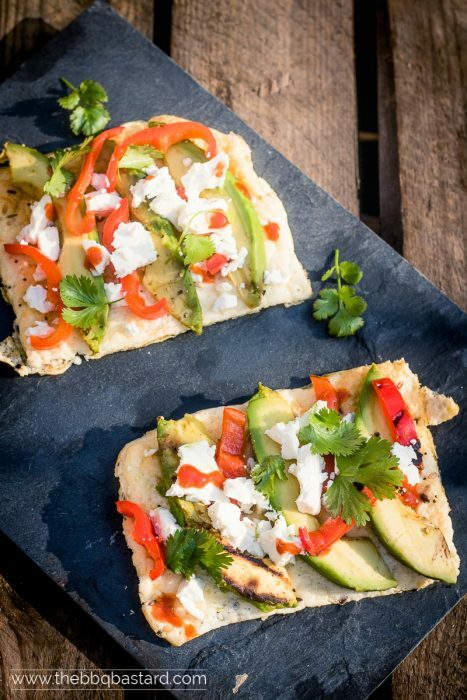 While grilling the vegetables and preheating the cast iron plate you can start making the cloud cookie pizza crust dough. But watch out for your vegetables. You don't want to burn them. Seperate the yolks from the egg whites. Make sure you put the whites in a fatless bowl and prevent the yolks from being mixed with the whites. Add the cottage cheese to the yolks together with the herbs and baking powder. Stir thoroughly. Beat the egg whites to a soft peak stage. This meaning you want the egg white to form soft peaks when you lift the beaters from the mixture. Carefully mix the beaten egg whites under the cottage cheese mixture to make sure it remains foamy. Otherwise you'll end up with cement instead of clouds. Put some baking sheets on the cast iron plate and pour the cloud cookie dough on top of it. Sprinkle some sesame seeds on top of it. 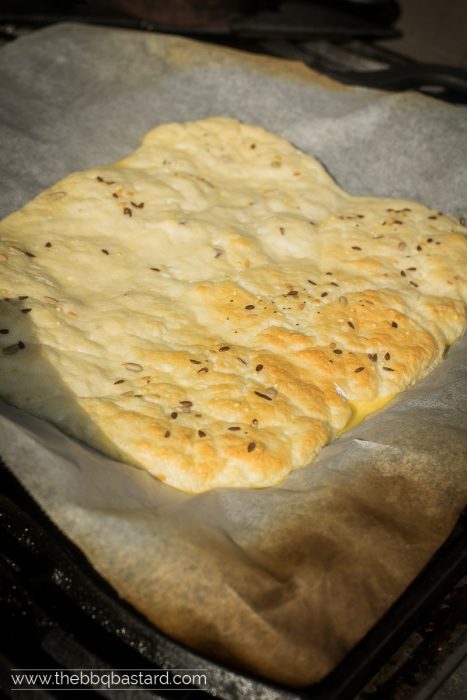 Bake for about 10 minutes on 1 side (dome temperature 180°C/350°F). Check every once a while. sometimes it browns earlier. Once the bottom of the crust is slightly brown you flip it on the other side and bake it for another 10 minutes (or less in case it's browning faster). Remove the cloud cookie crust from the cast iron plate and pour some sriracha (or tomato sauce) at taste on top of it. Add the grilled vegetables, feta cheese and cilantro. Have a great, light and healthy meal or serve as appetizers. - There are affiliate links on the "Napoleon rogue",  and "cast iron plate"
I love this post! Thank you for sharing your wife’s creation with us! I think more women need to step up to the plate and grill more! It’s a great way to cook food. Bravo! Thank you Marlee that is exactly why we wanted to do these posts! Thanks for the encouraging comment!